NEW DELHI: Benchmark indices jumped over half-a-per cent in Friday’s trade, as the rupee recovered some ground after Thursday’s sharp drop. An appreciating rupee draws foreign inflows. At 9.25 am, the BSE Sensex was ruling at 38,904, up 219 points. The NSE barometer Nifty50 was up 60 points at 11,658. Indices gained even as most Asian markets stayed cautious amid mixed signals on US-China trade talks. 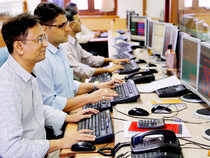 Buying was seen across index heavyweights such as HDFC, InfosysNSE 1.54 %, Reliance Industries, ICICI BankNSE -0.68 % and TCS. IndusInd BankNSE 1.20 %, YES Bank, Vedanta, Mahindra & Mahindra and Kotak Mahindra BankNSE 0.81 % were some stocks leading the Sensex pack. Asian Paints, Bharti Airtel, Maruti and HUL remained some of the laggards. The recovery in rupee lifted the investor sentiment. The domestic currency opened 13 paise higher at 69.03 against dollar on account of some selling in US currency by banks and exporters. The local unit had fallen 76 paise on Thursday to 69.16, after the RBI lower its projection for economic growth while shalshing the policy rate by 25 basis points. Oil prices fell on Friday, with Brent slipping away from the $70 mark after briefly rising above that level in the previous session, as traders fretted about progress in US-China talks to end a trade war.